Proving that "Nobody does it like Swan"
If life were fair, we would all sail Swans and drive Mercedes. I'm not too particular about which Swan; they are all kind of nice. 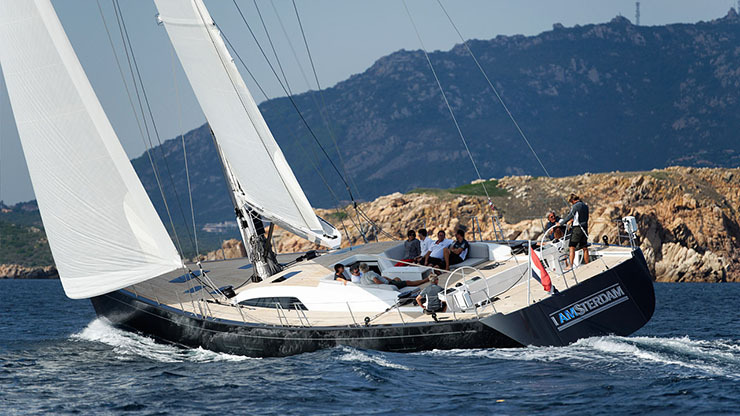 The Frers-designed 44 would do. 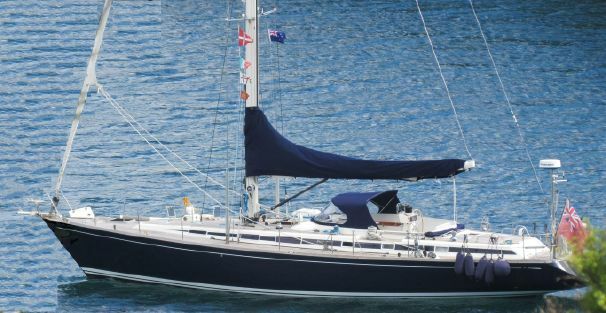 It is a big sister to the 36, with the new window treatment and emphasis on cruising comfort. A Swan 44 lies in its berth. 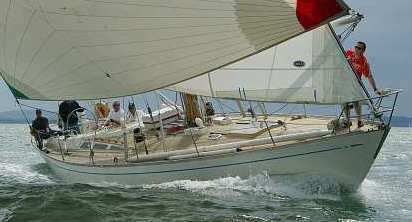 Nobody draws a better sheer than German Frers. The low, slow sweep to this sheerline bottoms out about station 8 and never really flattens out at the bow. It is as elegant as you can get and the designers at Nautor have done it justice with a beautiful line to the deck structure. The brochure says the boat was "styled" by Andrew Winch. I wonder if that means the interior or the deck and interior. Either way, nice job, Andy. 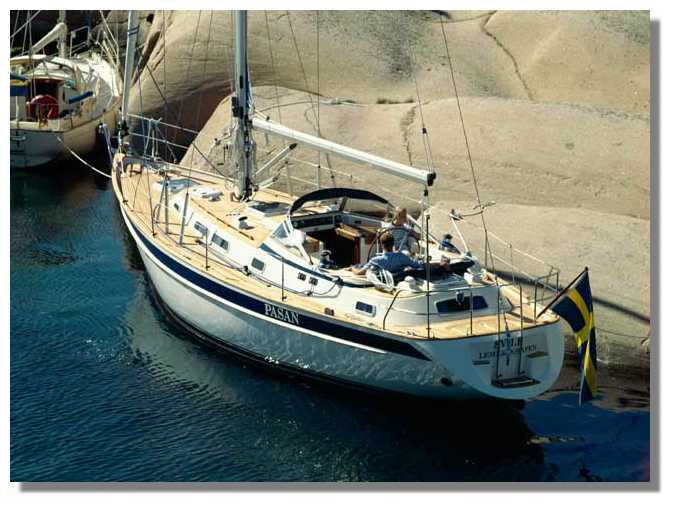 The hull is moderate D/L ratio 262, with the midsection not going quite flat at the centerline. There is moderate flare to the topsides and a max beam of 13.71 feet. There is a little reverse to the canoe body to elevate the counter aft combined with enough overhang to ensure a graceful look. The bow is quite short and purposeful looking. The beam is generous and pulled into the ends without exaggeration. The transom is heavily cambered with the corners knocked off for even more grace. You have your choice of Whale Tail type or "elephant foot" keel with the deeper model giving a draft of 8.2 inches. (Keep track of the increasing draft of cruising boats as we move to the 90s). The shoal keel version has a draft of 6'9". No mention is made of any rating rule with this design. Maybe we are getting back to good boats that you can race or cruise or just have fun with. Enter your local races and compete under the local rule. 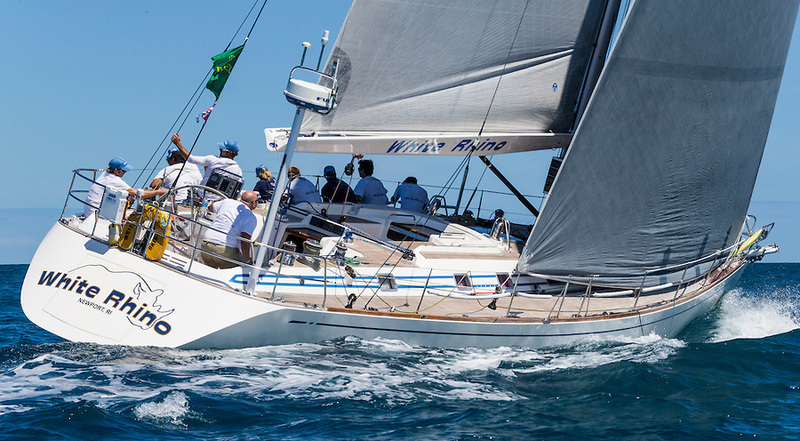 With a boat like the Swan 44, you stand a good chance of winning regardless of the rule. And, if you should lose, you can retreat to the saloon and bask in Swan-ness. 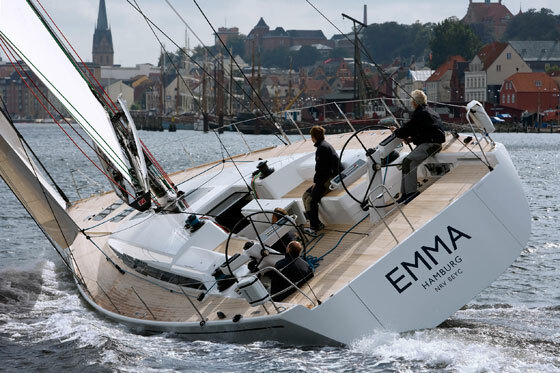 The newest Swans combine this quality with a style of layout that will warm the heart of the most serious cruiser. 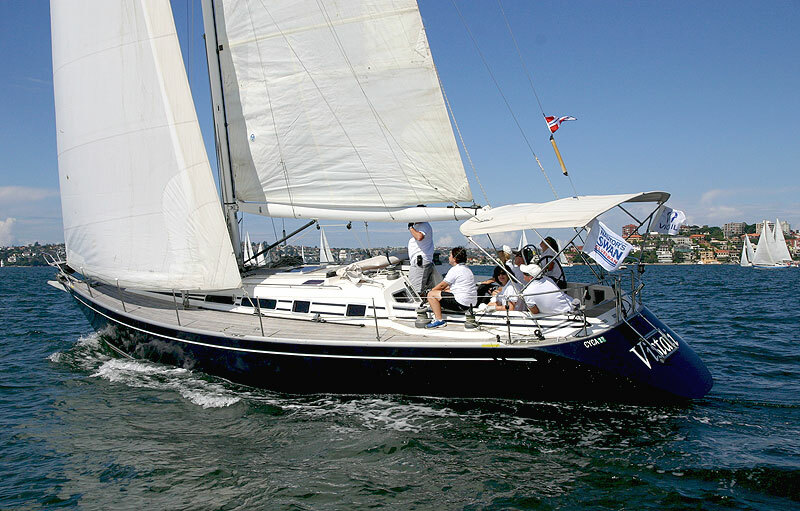 By opening up the companionway directly to the cockpit, Swan has avoided a pitfall of many new cruising yachts, the long bridgedeck. 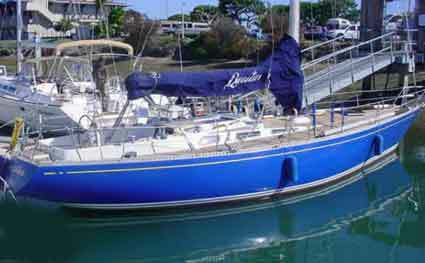 The Swan 44 cockpit leads directly to the companionway for ease of access and safety. This pushes the owner's stateroom off to port with the head to starboard. So they're not connected - how inconvenient can it be to walk eight feet? There is a large wet locker to starboard of the companionway. The galley is spacious with big freezer and frig. The settees have been divided by a centerline island settee and the old pilotberths have disappeared. The forward head is large (still no separate shower stall) and the entire forward end closes off to make a nice, private stateroom. It would take a bee sting on the end of my nose to make me uncomfortable on this boat. Things do change. The sailplan shows a fully battened main with lazy jacks. The mast is well forward with a small foretriangle and a light, balanced helm (I presume). There is a babystay and there are runners and the rig is held up with triple spreaders, but those are like the spoiler on the back of your Porsche. You need that stuff to make you fast. The SA/D ratio is 16.9, which puts this design in the sedate range but perfectly fine for your all-round family racer-cruiser. 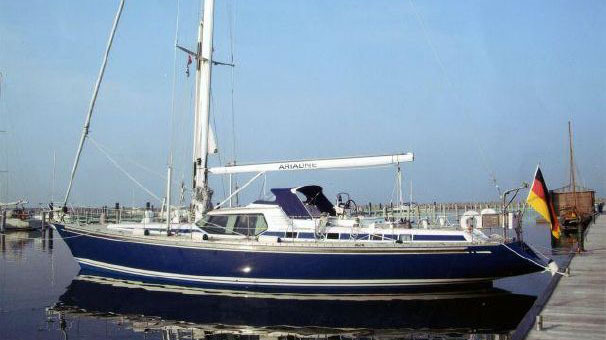 The deckplan follows in the style of the Swan 36 introduced last year. The large central windows are actually in two pieces but well disguised to appear as one unit. The 44 augments these with opening ports in the galley and nav areas as well as small hatches in these areas. There are also small hatches over the forward head and forward stateroom area. There is a wonderful, controlled symmetry to this deck and while the signature Swan wedge deck is disappearing on the smaller models, the new deck has an ultra-clean look of its own. Standard equipment on the Swan 44 includes rod rigging. Lewmar winches, teak decking in cockpit and the keel options of horizontal bulb and the mysterious "vertical bulb." If you have always taken Nautor's Swans for granted, take the time to go look at one at a boat show. I think you will be amazed at the style and class in which Nautor attacks and conquers the smallest of details. From the stem fitting to the galley drawers, nobody does it like Swan. Ballast 7,700 lbs or 8,200 lbs. Sail Area 890.3 sq. ft.